Study Abroad is dream of many students. They want to fly high in the sky, learn new things, get a degree in flying colors and become whose who of the Nation. However, to realize those dreams, everyone need a guide, some financial help, and study resources. World is not short of resources but reach is limited. The information that one need today reaching to him a day after is of no use. Enriching human resources is responsibility of every human being; some do it doing philanthropy, some start business and offer job, some do it through completely unique ways. Those are people not short of idea. Taking first step counts and I am glad, I took that first step by writing this blog for students, job seekers, parents and teachers. This is the First Post in an organized way on this Blog related Study Abroad and Tagged under "Study Abroad" Category. In this category I will post articles on regular interval related Higher Education in Overseas, Planning Study Abroad Trip, Studying and Living in a Foreign Country, Choosing a Course, Migration Issues, List of Colleges, List of Colleges, Scholarships for Study Abroad, Finding Internship and everything in between. No, I am neither a Jack nor a Jill. I publish this blog to fulfill my voicing appetite. And guiding students is best thing to do. 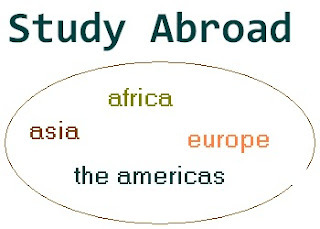 One can find all Study Abroad Information published on this blog hitting Study Abroad Tag or Using Search Box. Students who do not find a relevant information here can count on me for asking questions. Here is: how to ask a question, the way, I resolve your problems and more.